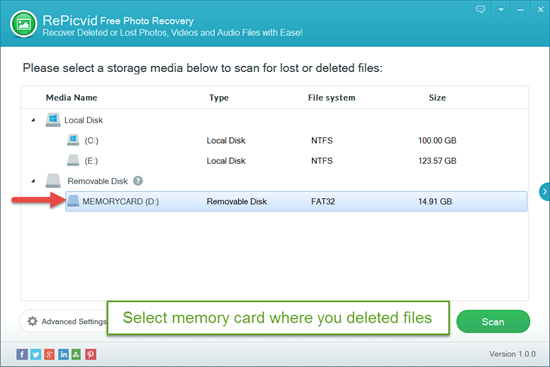 How to recover deleted files from a memory card? Many people have ever posted the same question to forums, groups or social media for help but no positive answer. As a kind of handy data storage device, memory card is widely used in digital cameras, DV, mobile phones, music players, etc. But now and then, you may suffer sudden data loss when deleting files, formatting memory card or just simply transferring files. What’s worse, there might be precious moments of photos or videos preserved in the card. Luckily, your deleted files are not irreparable at this stage. 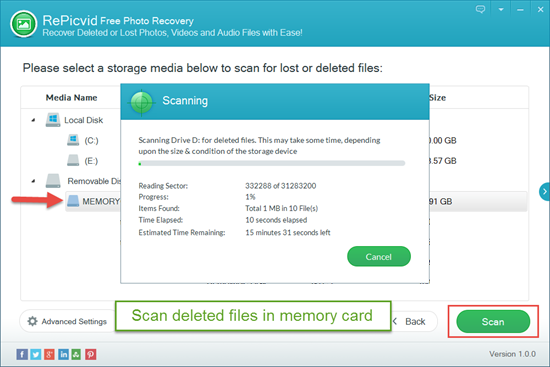 Here is a free memory card recovery software which can retrieve image, video and audio files from memory card for free with 3 simple steps. Don’t be panic, if you happen to encounter this problem. There is a great possibility to restore the deleted files from your memory card as long as they are NOT overwritten. Highest recovery rate for lost photo, video and audio files in the industry. Support SD card, CF card, XD-picture card manufactured by SanDisk, Kingston, Samsung, Toshiba, Sony, Transcend, Lexar, Fujifilm and so on. Scan your device under read-only mode and will never damage your data or memory card. Allow full preview for all images, videos and audio files deleted from memory card. Absolutely free to undelete photos from memory card. Prompt and professional custom support. Just download this free memory card recovery software and start with the following tutorial. Before starting the memory card file recovery process, please remove the memory card from your cell phone or digital camera and connect it to computer with a card reader first. Alternatively, you can also directly connect your device to computer with USB cable. Note: iPhone and other Apple mobile devices do not support memory card, but you can try a free iPhone data recovery software to get lost data back from iOS devices. Launch the free memory card recovery software and choose a Recovery option. Then click on the memory card that is detected by the software. Next, scan the memory card for lost files. After scanning, you are allowed to preview the deleted files in detail one by one. 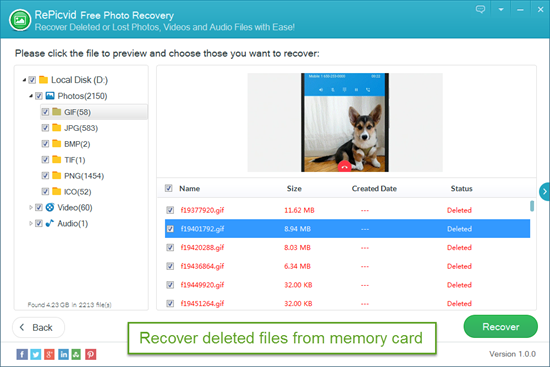 Check what you want and then click “Recover” to restore those files from memory card. At last, select a store location and save them onto the local disk of your computer. When the device prompts for a memory card error, you can re-plug memory card and see if it solves the problem. When asked to format the card, you can try to use RePicvid Free Memory Card Recovery to Scan & backup the memory card. If memory card shows locked, you just need to remove the card from camera and adjust the lock switch to unlock position. If your card has a password and you forget it, open the “MMCSTORE” file generated under the sys/data folder. Then copy this file to your computer and use notepad to see your password. Click on Start icon on PC, enable Run Command and enter CHKDSK h: / f (h: represents the drive letter, and f represents the repair parameters). There are many reasons why SD card is not detected on Windows computer. If you are experiencing the same issue, you have to exclude the cases one by one to solve this problem. Check how to fix SD card not showing up on Windows 10.